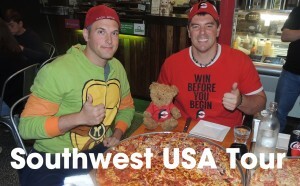 This article features the entire schedule for Randy Santel and Mitch Dombrowski’s Southwest USA Winter Tour that they followed throughout their trip so that everyone could follow along and know when, where, and what time all their food challenges were. Results got posted after the challenges took place too. From Tuesday, December 26, 2017 through Sunday, January 14, 2018, Randy Santel and “Magic Mitch” Dombrowski traveled around the southwestern quarter of the United States, spanning from Oklahoma and Texas all the way to southern California. The 7-state tour included Oklahoma, Texas, New Mexico, Arizona, Colorado, Nevada, and California. Now that the trip is over and the videos are being uploaded, the video links will be added as they become available. Check them out if interested, and thank you all for watching our videos and supporting our YouTube and Facebook channels!! Thank you for checking out Randy & Mitch’s Southwest USA Winter Tour Schedule! !